Window feeders are a great way to bring birds up close for amazingly detailed views. But one problem with window feeders is they’re a squirrel magnet. Now Duncraft has solved the problem of squirrels getting on window feeders with the first ever Squirrel Proof Window Selective. Window feeders are a great way to bring birds up close for amazingly detailed views. But one problem with window feeders is they’re a squirrel magnet. Squirrels on window feeders make great entertainment for indoor cats, but most bird lovers aren’t interested in watching squirrels eat all the bird seed. Now Duncraft has solved the problem with the first ever Squirrel Proof Window Selective. It’s the only squirrel proof window feeder on the market today. Duncraft’s customers frequently ask the question, “How do I keep squirrels off my window feeder?” Until now, there really wasn’t a good answer to this question. There simply wasn’t a foolproof way to stop squirrels from jumping up to a first floor window, where most people put their window feeders. But Duncraft, always sensitive to their customer’s wants and needs, was determined to find a solution. Duncraft already makes squirrel proof feeders and also window feeders. By creating a special window bracket with suction cups, Duncraft was able to use their best selling Squirrel Blocker Bird Feeder and adapt it so it attaches to a window. The Squirrel Blocker has a mesh tube for feeding sunflower seeds. Caging surrounds the tube—small birds can reach through the caging to get the seeds, but squirrels can’t reach in and chew the tube or get the seeds out of the mesh. 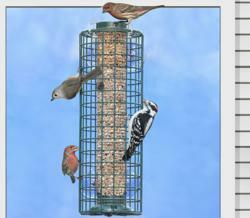 Now Duncraft customers can enjoy watching the birds without pesky squirrels stealing the seed. Duncraft’s new feeder is product number 4241, holds 1 ½ lbs. of sunflower seeds and is 16” tall. It retails for $49.95 and can be seen at http://www.duncraft.com.